Been a long time since I posted some artwork. I spend most of the day drawing at the studio, all of which artwork I can't yet post, and tend to work more on writing in my limited spare time. But I thought I'd post a little exercise I did recently. Something I struggle with is handling multiple characters in a panel or in a particular pose in which they all interact. 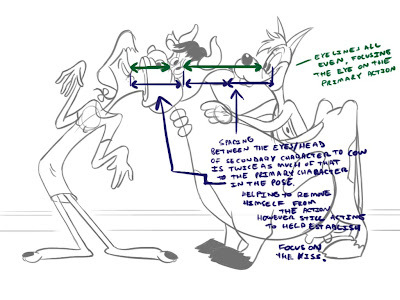 Below is an attempt to understand better the science of posing multiple characters together. A screen grab from Avery's 'Rural Red Riding Hood'. First I traced the drawing (one of the greater advantages of having access to a cintique). 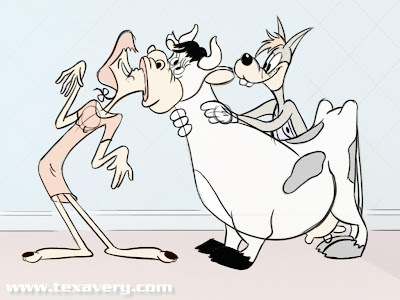 The main focus of the pose (and the gag) is Red Riding Hood kissing the cow. 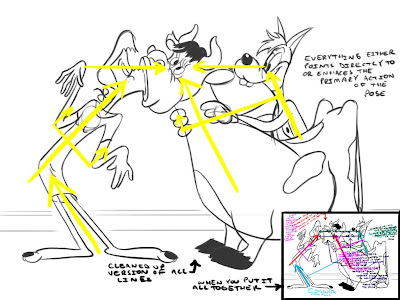 All of the line-of-actions work to create a focal point centered around the smooching skulls of Red and the Cow. 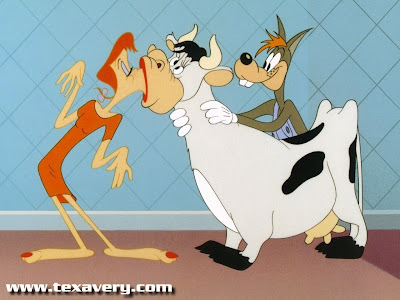 Red's upper body leans in towards the Cow, as does the Cow's upper body into her. 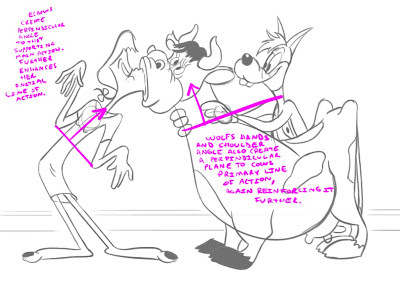 The wolf, as a secondary character to the pose, enhances the juxtaposing angles by mimicking the Cow's slant and creating an even greater push towards Red. 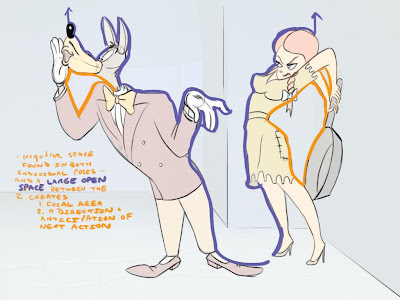 The Wolfs angle leads the eye towards the focus of the pose and draws no attention to himself. Red's legs have the same affect on the pose. 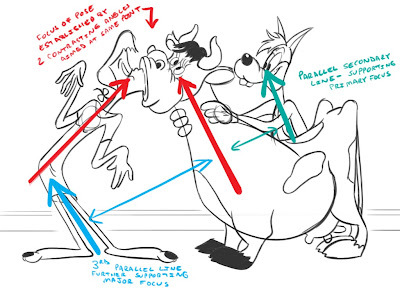 By having a parallel angle to that of the Cow and the Wolf it even further helps to push the eye towards the important part of the pose. 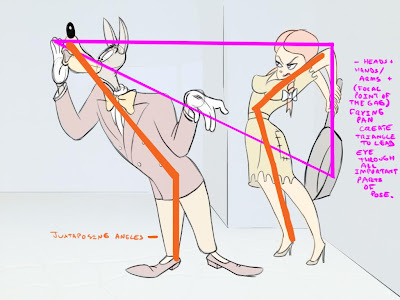 What we find is 3 repeating angles pushing against 1 angle, creating a clear focal point. The eyeline of all three characters lie on the same plane, leaving no question as to where you should be looking. 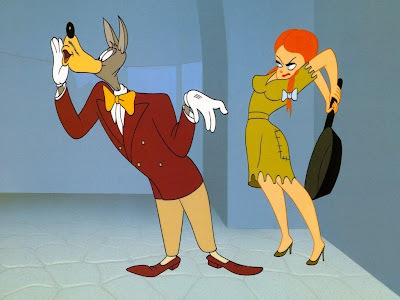 The extraneous limbs of both the Red and the Wolf continue the idea of supporting the main line-of-action by creating a perpendicular angle. 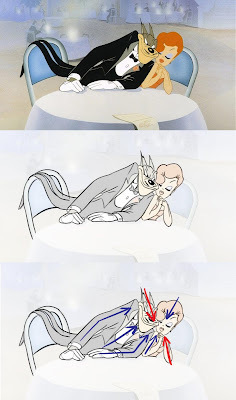 It helps lead the eye to the kiss. 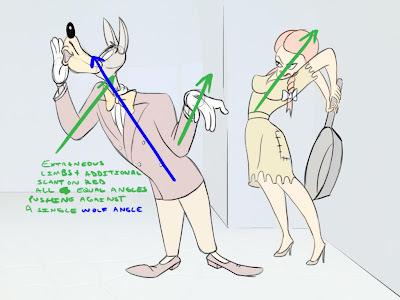 Everything either points directly to or enhances the primary action/focus of the pose. This is totally 2D-Design all over again, hansel. ...and reminds me of that first project we did. Wow, really awesome study! Thanks a lot for sharing!! !